I can't tell you how much I love Eggs Benedict... and when they have it for breakfast here at work, I totally take advantage. With extra Hollandaise sauce. I mean, sopping up that sauce with my toasted GF bagel is absolute deliciousness. What I like about this version of Hollandaise sauce is that everything is whizzed up in a blender and I don't have to whisk over the stovetop for minutes on end. The key is to make sure the butter is hot when incorporated into the blender with the eggs. That will help give the right texture and help in the emulsification. 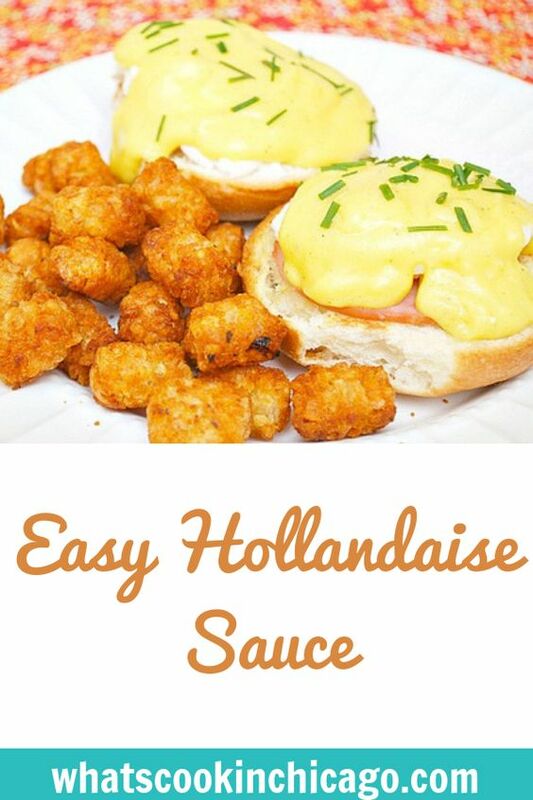 Definitely try this out for your nest Eggs Benedict breakfast or whenever you want to elevate your meal with that rich, buttery, eggy Hollandaise Sauce! Place the egg yolks, lemon juice, 1 1/2 teaspoons salt, 3/4 teaspoon pepper in the jar of a blender. Blend for 15 seconds. With the blender running, slowly pour the hot butter into the blender and blend for 30 seconds, until the sauce is thick. (You can leave it in the blender at room temperature for up to 1 hour. If it is made in advance, add 1 tablespoon hot tap water and blend for a few seconds before serving. What are those delicious looking potatoes? I've never had eggs benedict before. Is it any good? My mom never made stuff like this for me coming up because we couldn't eat pork. What do you do with such a large quantity? This has always been my issue as I just need enough for one person usually and I'm not aware of being able to store hollandaise for long. Dterei - this recipe makes 1 cup so it's enough to top 3-4 servings of eggs benedict. Leftovers are great over steamed veggies like asparagus, brussel sprouts or broccoli. You can use it in casserole dishes too. Hope this helps! 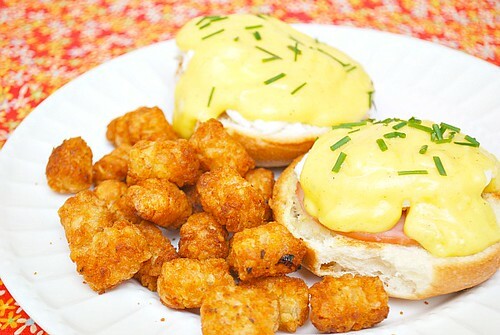 I love Eggs Benedict but I've never tried it at home. This sauce looks like a great one to try! can you freeze hollandaise sauce?